The Violet-Crystal Flame anchored by our I Am presence, in the communion of two souls, Violet and Crystal, brings to all the peace and transformation of the restrictions kept in our records. The first function of the Violet-Crystal Flame is to act as an indication of what needs to be purified within us. Together with this function the Violet Flame transmutes the restrictions, emphasizing them for enlightenment. In our soul records there occurs the liberation and transcendence of the constraints. At the end of the process we will radiate peace through the transformation of the blocks of thoughts that bind us to pain and suffering in the earthly experience. The Violet-Crystal Flame is a powerful instrument at the disposal of all those who are willing to transcend their experiences with matter, connecting to the I Am or to the soul level to understand the experiences from a higher view of life. It acts as an alchemical process, which, by pointing out the impurities contained in the element, transforms them into something diverse, purer and connected to the level I am of manifestation of the soul. It is a flame of elevation through the purification and transformation of all that restricts us on the physical level of manifestation. The Violet-Crystal Flame exposes us in all purity, now transformed into the essence of peace, leading us to the resurrection of life in unity of hearts and purposes. But we warn you, it is not a process that will always be gentle, because it requires courage to strip us before the world, taking deep contact with our records that need to be enlightened and agglutinated in a level of experience and wisdom of soul. It requires courage, in transforming the paradigms that bind us to the planetary energy matrix, accepting our own imperfections, our attachments, everything that has led us and kept us trapped in the karmic wheel of incarnations. When working with the Violet-Crystal Flame, physical manifestations may arise, such as pain or discomfort in some parts of the body, as well as deep pains of the soul such as sadness, tiredness and feeling of solitude. These are characteristic feelings of the death of the old Self and the emergence of the inner transformation that will lead to peace in the present. To soften these symptoms it is necessary to accept all that we are, with love, forgiveness and above all the understanding that we all bind ourselves to certain restrictions on an akashic level so that we could be present in the material experience. 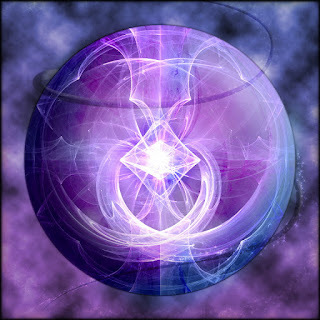 The hour of transformation, liberation and resurrection has arrived at the truth of soul, and the Violet-Crystal Flame can be an important instrument in this path of elevation of the soul, transmuting our restrictions to the manifestation of the purity that we are. In the end we will be anchoring the golden flame of balance so that we have wisdom in dealing with this profound process of liberation from all our inner truth, without masking, without subterfuge, being only truth without attachment, releasing everything to the understanding that we are and will always be the Manifestation of the unity of God. To invoke the crystal violet flame and perform the work of transmutation and return to the inner purity, one must first remain in a meditative state. For this, sit comfortably or in a lotus position and breathe, calm the mind. 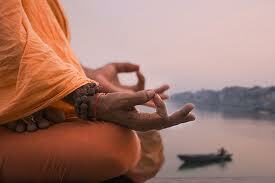 Remain with your hands on your legs doing the Gyan Mudra. Then. Invoke the protection and presence of all the masters of the seven rays, preceded by the Guardians, Archangels, and Elohim. Invoke the presence and protection of your spiritual guides and the divine I AM presence. Remain in this silence accepting the thoughts that come, calmly. And to the sound of the Gayatri Mantra, watch them go as they came, without altering their calm and peaceful state. I invoke the Crystal Violet Flame." "I anchor the Violet-Crystal Flame, and command that remains sustained in me, transmuting all the restrictions of my akashic record, and manifesting the inner purity. I invoke the White Flame that will manifest within me the inner purity of which I was created and to which I shall return. I manifest in myself the transmutation of all constraints and anchor the Crystal Violet Flame. In the name of the Divine Presence I Am, I anchor at this moment, in my DNA, the Crystal Violet Flame. I Am, I Am, I Am." In the second stage, we will work your external environment. Once the energy is anchored in you, remain in meditative state. But you enter a stage where the Violet Crystal Flame flashes throughout your auric field. And it expands until it radiates all its bodies. Starting from the truth that We Are All One. The next step is to take that energy into your outer environment, which is One with you. It is part of His Being. For you are unified in One with your environment. You notice the energy coming down the coronary very intensely, where it starts to form a spiral around you. This spiral of Crystal Violet Flame will expand and grow until you reach the desired proportion. You control this expansion. "I command that the purity of each Being radiated with the Crystal Violet Flame be sustained." Invoke the Blue Flame and enclose all the outbreaks of White light in protection Merkabas. Command them to stay propped up. Invoke the Divine Presence I Am of all worked life forms. Deliver the work done for the Divine I Am Presence of every form of life, thanking and requesting the anchoring of the Golden Ruby Flame, to manifest the peace and love of these beings in their journeys against each other's I Am. "I am the Crystal Violet flame manifested, I anchor transmutation and purity on this planet. I am the peace and transformation of the planet, I anchor the Violet Crystal flame, so that all beings return to the purity of which they were created, transmuting all the restrictions. Michele Martini and Thiago Strapasson Higher Self - March 17 and 18, 2017.